This post contains affiliate links. Visit our Disclosure page for details. Safety is always a concern when traveling and using a secure travel purse should always be a priority. We’ve rounded up the best anti-theft travel bags for women according to our readers. 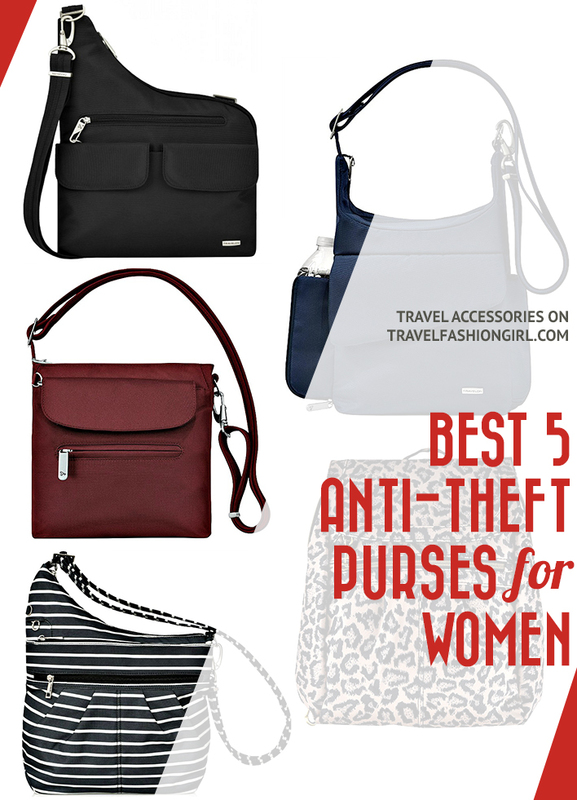 Read on to learn which of these anti theft purse styles they love the most! If you don’t have time to read the entire article, this is the most popular theft proof bag for travel! No matter which destination you’re traveling to, safety should always be a top priority. Anti theft slash proof bags can help protect your belongings by making it more difficult for thieves to rip your bag or cut the strap. In Paris: A traveler shared a story of seeing someone’s entire purse get slashed from the bottom. Everything fell out, allowing the thieves to grab it and run. In Tanzania: A volunteer was mugged for her purse with a knife (in which case it doesn’t matter what type of purse you have–just hand it over). In Madrid: An expat had her belongings stolen when walking home late at night. In Southeast Asia: It’s common for thieves on motorbikes to drive past you and cut or rip the strap of your travel purse from your arm, in some cases, dragging you with them. Read one traveler’s story here. While there are reports of thefts from travelers, there is a much higher number of people who’ve never experienced anything even close to these scary situations. These stories are not meant to scare you. That’s the last thing I want you to feel — the world is a much safer place than we give it credit for. It’s good to be well-informed and cautious, but please don’t feel paranoid. Fortunately, in over eight years of full time travel I’ve never had my travel bag, purse, or any other belongings stolen (so far). So, while theft does occur, it shouldn’t deter you from enjoying your travels. What is an anti theft bag? An anti theft bag is a purse, backpack, or luggage with built-in safety features. It’s designed to help you avoid becoming a victim of theft at home or abroad. They can also be referred to as theft proof bags or slash proof bags. Pick pockets tend to target busy tourist areas in large cities all over the world; some female travelers feel safer with an anti theft purse vs a regular purse. 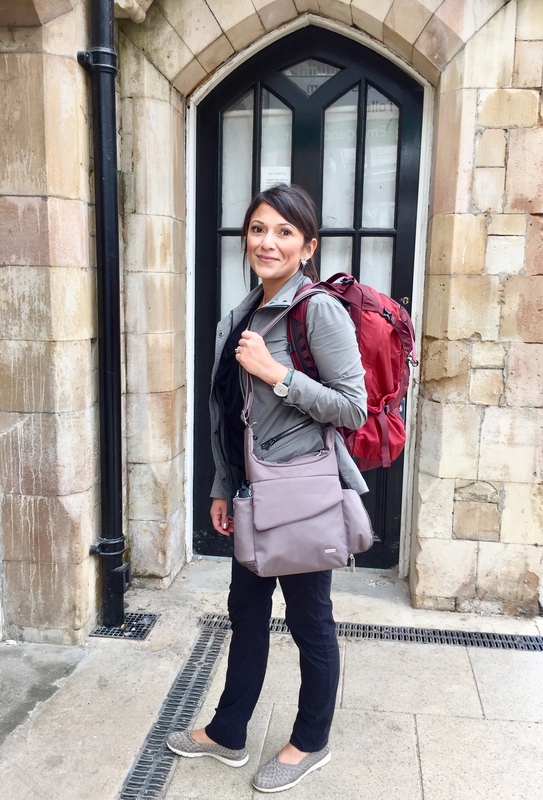 Tip: Female travelers think the best travel bag is a cross body style as it can be worn securely across their body instead of wearing it loosely slung on their shoulder. What is the best anti-theft travel purse? Spoiler alert: Want to know the top seller? It’s the Travelon Crossbody Bag. 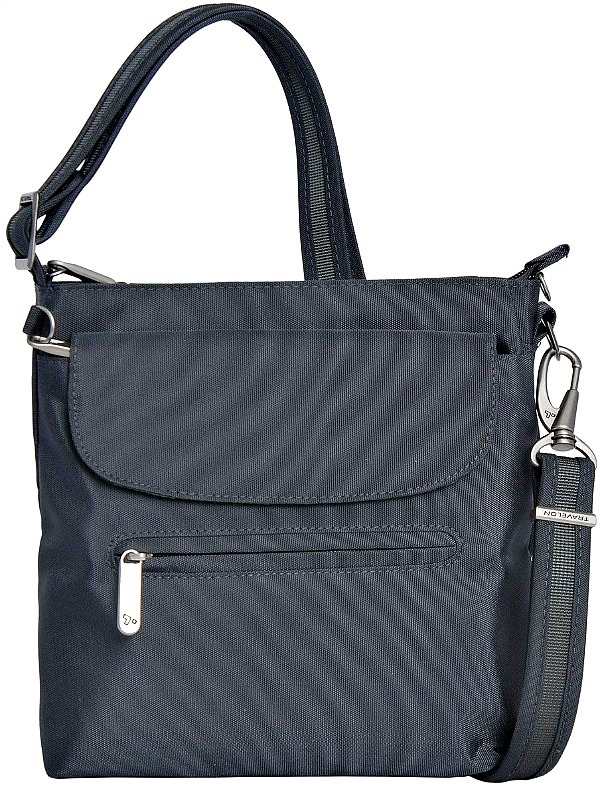 The Travelon Anti-Theft Cross Body Bag is the best selling purse for travel! In fact, our readers love this purse more than any other style in their travel bag collection. Retailing for as low as $30, this cross body is available in over twenty colors. Our readers favor the bag in a classic Black but two other popular options are the Midnight and Stone colors. 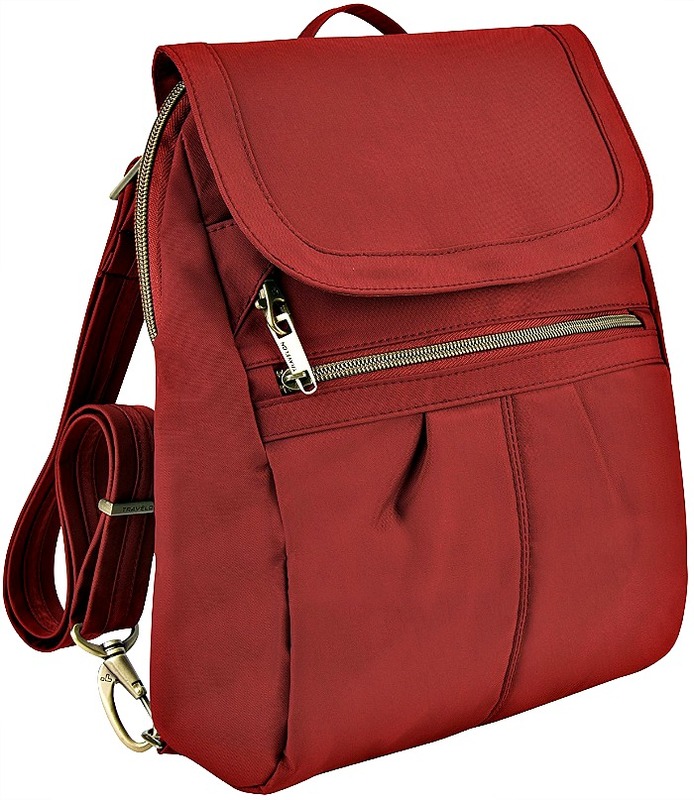 It has a slim design featuring slash-proof fabric and an adjustable, cut-proof shoulder strap. You can attach it to any post or chair for added safety and it also comes with an RFID blocking card slots. One of the most important features in all Travelon anti theft purses is their “lockable” zippers with little latches you can use to avoid pickpockets. This feature is easy to miss but absolutely essential and it’s one of the top reasons this brand has the best travel handbags. Without overstuffing it, you can easily carry a small water bottle, travel size umbrella, phone, and other daily essentials. There are separate areas for credit cards, pens, and an interior zipper pouch for money or loose change. As a bonus, the material is easy to clean and hard wearing making it ideal for travel. One thing to note is to avoid putting anything of value in the two front pockets. Keep things you need easy access to such as chapstick, eye drops, tissues, or some spare change but store your wallet on the interior zipped compartment closest to your body. Buy it here! If you’d prefer a roomier bag and don’t mind carrying weight on your shoulders while sightseeing all day, consider the Classic Messenger Bag shown below instead. 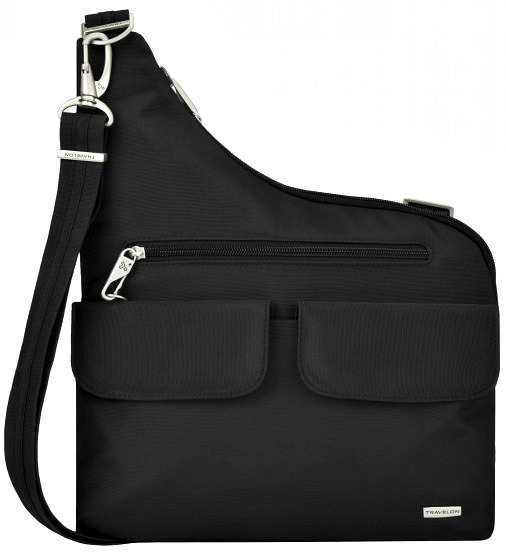 Absolutely loved the Classic Messenger Bag for my recent trip to Europe. It was very spacious, offered RFID protection, plus it had two compartments for a water bottles and a travel size umbrella. Available in over ten colors, this is another great anti-theft purse. It’s more spacious than the previously mentioned Anti Theft Cross Body Bag and even has two expandable side pockets to hold an umbrella and a full-sized water bottle. This is perfect for travel! 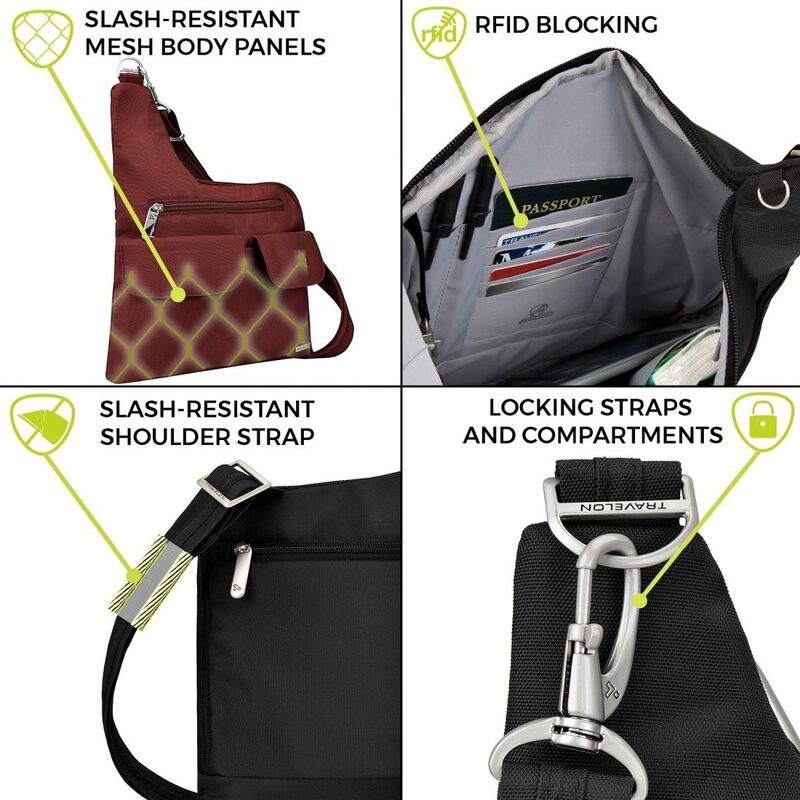 Like all Travelon anti theft purses it has easy to clean slash-proof fabric and straps, lockable zippers, and extensive RFID blocking organizational pockets. Even with the cut proof cable, the bag is relatively lightweight. 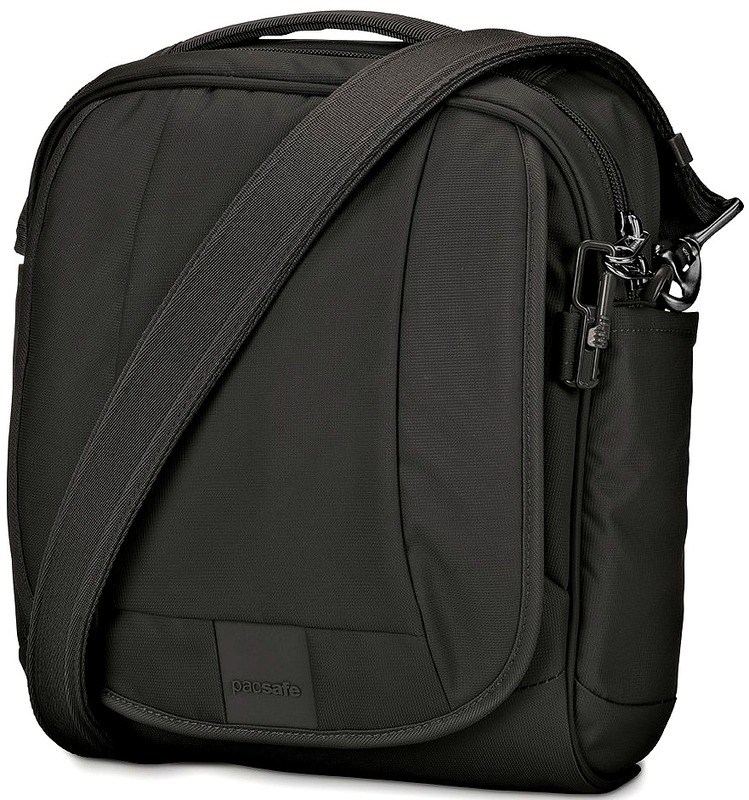 Unlike the Cross Body bag it also has a security feature (lockable zippers) on the outside pocket. However, I’d still recommend keeping valuables in the interior compartments. In addition to the basics, it will also fit a paperback book, small tablet or kindle, snacks, sunglasses, and more. If you’re tall, the strap is long enough to allow me to wear the bag comfortably as a cross-body. However, if you’re shorter, the strap can be easily adjusted to fit your height as well. Aside from traveling, many of our readers also like this bag to commute to and from work on public transportation making it a worthwhile investment. Buy it here! When we read that this bag has the best features of a large purse without the bulk and the weight – we were sold! The Travelon Classic Mini Anti-theft Bag is a small travel purse that can carry a all of the daily essentials. 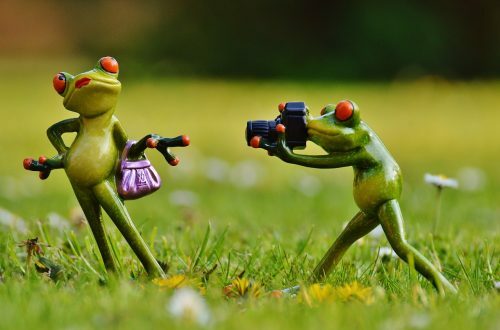 It’s ideal for women that prefer a smaller purse or for sightseeing days where you don’t need to bring as much with you. 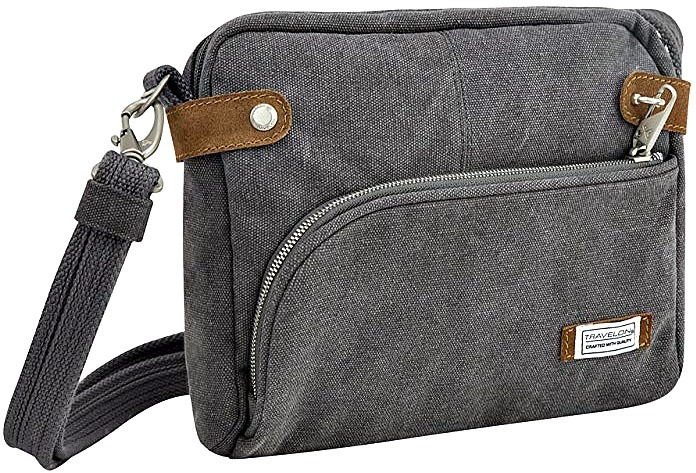 This slim anti-theft shoulder bag offers a locking main compartment, an RFID pocket for a passport, credit cards slots, and adjustable shoulder straps which can be attached to a chair or post using the included carabiner. The straps are also a good width, strong enough to be worn securely but not too narrow for a comfortable fit. The mini zippered pocket in the front is perfect small things like chapstick. 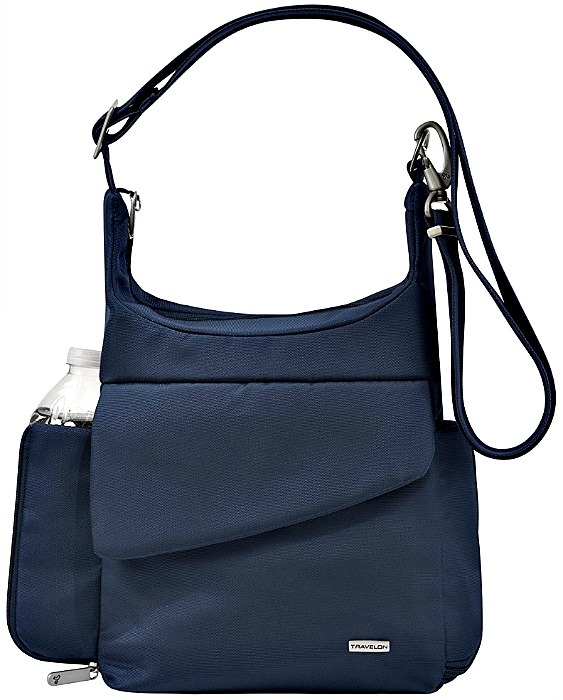 At just 10oz featuring Travelon’s durable nylon water-resistant material – this bag is a clear winner! Buy it here! The Travelon Anti-theft 3 Compartment Cross Body is part of their Signature Collection, which offers sleek, sophisticated styles including this backpack, wallets, and various sized purses. The fabric is a water-resistant nylon making it easy to clean in addition to keeping your belongings dry during light showers. One of my favorite things about the Signature Collection is the subdued antique-brass hardware. It looks more like a regular bag vs an ”anti-theft” bag. Based on looks and functionality, this is easily the best traveling purse for Europe and other major destinations! Choose the classic black color for a discreet safe travel purse or opt for a colorful option to match a vibrant wardrobe. Buy it here! Ever since I started having back issues, I’ve found that purse backpacks are a good alternative to travel handbags worn on my shoulder because they evenly distribute the weight across my back (obviously without carrying too much weight on me). Because of this I’ve been on the hunt for cute and stylish options and the Signature Anti Theft Backpack by Travelon was a great find! It’s also a part of their Signature Collection, as mentioned in the purse shown above. It’s become so popular that it’s now available in various colors including this fun, casual leopard print that’s sure to infuse a vibrant feel to an all-black minimalist wardrobe. Dare I say, “rocker chic”? Not too bad for an anti-theft backpack purse! Currently, I own the grey color, which was a nice alternative to my black purses. It has a lovely coral lining and looks like a regular cute purse backpack. The roomy main compartment has RFID blocking card and passport slots, an open top wall pocket, zippered wall pocket and tethered key clip with LED light. There’s a hidden slash pocket under the flap, perfect for sunglasses or a smartphone. In addition there is locking front zippered pocket. The Anti-theft features include slash-resistant construction, locking compartments, slash-resistant and locking straps to keep you and your belongings protected. Great for minimalist travelers that want to go hands-free and only carry the essentials. This is a slim backpack so don’t expect much space. It might be a good option for summer travel when you don’t need to carry around extra layers. Buy it here! How do I choose the best purse for international travel? The best purse for international travel may or may not be one that has anti theft features. It’s something an individual traveler has to decide based on their comfort levels with safety. However, the one thing that all traveling purses should have is an opening with zippers that can be securely closed. Avoid bags with wide openings or faulty clasps. You also want to consider the weight and size of the bag as you’ll be carrying it for hours while sightseeing. Unless you’re carrying items for other people or children, avoid choosing a bag that’s too big. It should just hold your daily essentials and enough space to store a couple of layers if you’re traveling in cool weather. Take style into consideration and remember that an outdoors backpack will look out of place in a big city. The idea is to blend in. Choose a the style of bag that you would also use at home. If you’re looking for feminine anti-theft travel bags, then Travelon has a wider variety of options. If you’re on the hunt for a no-frills unisex anti-theft bag, then Pacsafe might be your best bet. The details are what stand out the most. I particularly like the metal hardware, which makes the designs look like “regular” purses. Buy it here! For sporty slashproof bags, Pacsafe has several options to choose from, including the popular LS200. It’s incredibly spacious and has a versatile, unisex look. They also have a backpack purse that’s large enough to fit a laptop and could easily function as an ideal day pack while traveling around major cities. The CS350 comes in three colors including cranberry, teal, and classic black. Where Pacsafe truly excels is their anti-theft travel backpacks. They offer them in various sizes including a roomy, carryon friendly 40L, which opens from the side to give you full access to all your belongings. Buy it here! Where can I buy an anti theft purse? You can find theft proof bag brands in travel stores or department stores but we prefer Amazon as it’s easy to shop and you can usually find the best deals, too! 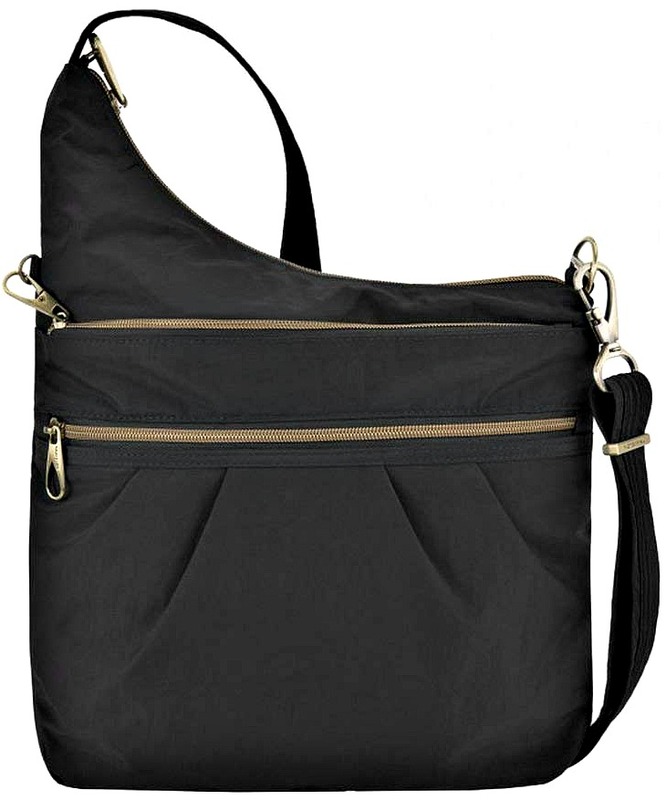 The Travelon Crossbody Bag in black is the most popular anti theft purse for travel! You can buy it on Amazon. Travelon anti theft bags are the most popular option for our readers. They absolutely love this brand, which is why the top selling anti-theft travel purse styles are all from Travelon! While some of our readers do buy Pacsafe or anti-theft purses from other brands, the vast majority do prefer Travelon. 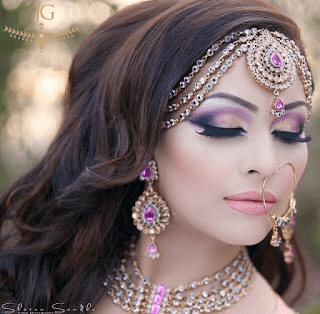 I viewed each of their entire collections and found them to be quite distinct in what they had to offer. This is a quick review of the best anti-theft travel purse options listed above. Watch the video above for more tips on how to keep your stuff safe while traveling. Choose a cross body purse and always wear the strap across your body; don’t wear the strap hung over one shoulder. Avoid carrying all your valuables (including your passport) in your travel purse in busy tourist areas or when attending markets or festivals. Use additional anti-theft products like a bra pouch or money belt to hide the majority of your cash. Only carry the money in your wallet that you’ll need for the day. See a full listing of anti-theft products here! Have your bag positioned towards the front, not against your back side. Hold your purse close to you when in crowded trains or public transportation. Avoid walking next to the street where your travel purse could be yanked from your arm by a motorbike or vehicle. Look up scams and thefts in your travel destination. For example, search topics like “Bali scams” or “Tourist theft risks in London”. For more tips, please read how to keep your passport safe while traveling! Watch my video on TPSY TV for a few more anti-theft products. Please note: The anti-theft travel purse suggestions and tips offered here are meant to encourage cautious travel but cannot guarantee that theft won’t occur. What are some of the precautions you take when you travel to keep your valuables safe? What do you think is the best travel bag for women? Share and comment below! I hope you liked this post on the best anti-theft travel purses. Please share it with your friends on Facebook, Twitter, and Pinterest. Thanks for reading!